One more post on writing generic algorithms. Let’s take a non-trivial non-generic algorithm and write a generic version. We’ll port a Java implementation of merge sort, and also look at some other interesting things we might do to some Java code when converting it to Swift. Why bother with a merge sort? Well, the standard library comes with a very efficient in-place sort, based on the introsort, but it’s not a stable sort – that is, two otherwise equal entries aren’t guaranteed to stay in the same order, something that is often expected in things like grids that sort when you click a column header. To start off, here is a Java version of a bottom-up merge sort, taken from Sedgewick, in all its Java-y C-for-loop-y zero-based-integer-index-y glory. Check out the vertigo-inducing braceless for loops! This is generic on the array’s contents, but not on the container (not that you couldn’t write a container-generic version in Java too, but this isn’t a Java blog, I get quite enough Java in my day job thanks). A good first step to turn this into a generic Swift algorithm would be just to port it to Array first. But even this presents some interesting problems – it’s not just a straight port, despite Java and Swift’s common ancestry. So let’s port it to Swift and make it more Swift-like at the same time, while keeping the algorithm broadly similar (speaking of which, yes, I know you can do it recursively but we’ll stick with the iterative version). When needing a stable sort, the whole point is that you’re only comparing part of the values – you sort by last name, while wanting rows with the same last name to stay in the same order. Obviously that means that the two values you’re comparing are not substitutable. So it probably only makes sense to implement this sort with a comparator function. Never, ever, conform to Comparable by comparing only part of the visible properties of your type. The first problem we face is that temporary storage array aux. Well, two problems really. The Java version does something that would be pretty monstrous in anything other than a textbook example – it uses a static variable. This would be fine for single-threaded code but if ever you used this same function simultaneously from two threads (even on two different arrays) then kerplowie. Brings back fond memories of debugging production problems from someone calling strtok from multiple threads. Sorry, did I say fond? I meant traumatic. So we need another way. We could just declare a new array inside merge every time, but that would allocate fresh array storage on every call, which would be horribly inefficient. Alternatively, you could create the array once in the sort function, just like in the Java version, but then pass it as an argument into the merge function. This would ugly up the code a bit. 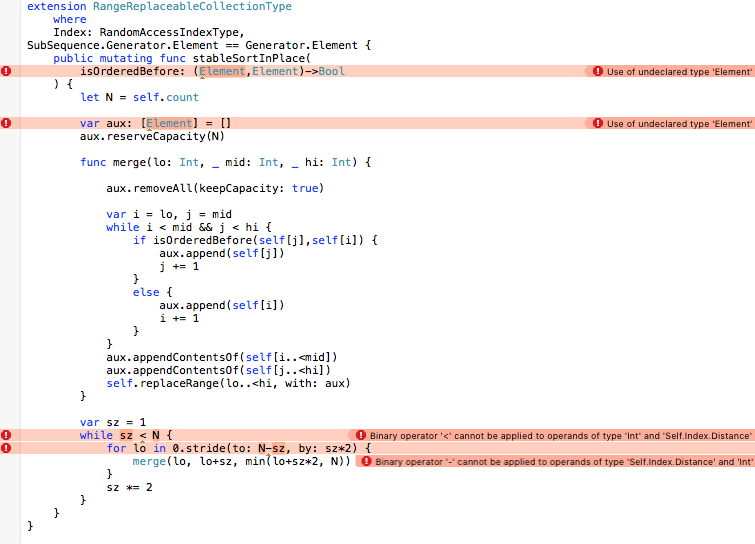 But more importantly, it wouldn’t work with Swift arrays, because they are value types. If you created an array in sort then passed it into merge, it could be copied(-on-write), not re-used, which would be even worse than declaring a new one. When a function closes over a variable, it captures it by reference. This means that merge and the outer sorting function will share the same instance, exactly what we want. Unlike the static approach, there’s no risk that a second call will use the same storage – aux is still local to the call to sort, and two different calls will use two different local storage arrays, and so will their inner variables. The one downside of this is we wouldn’t be able to expose our merge function publicly, even though it could be a useful algorithm in its own right. By the way, even though we declared merge with func, it is still a closure – don’t conflate the term closure (functions plus captured environment), with closure expressions (the Swift term for the shorthand syntax for writing anonymous functions). Local functions declared with func are just as closurey as closure expressions. Here’s another place where both Java and Swift start from their common ancestor, but then Java zigs while Swift zags. In C, you declare a variable, and then you can immediately read from it without giving it a value. Everyone agrees that this is all very horrible and monstrous, but to not have that you have to choose a path – give everything a default value, like in Java, or ban reading until you’ve written, like in Swift. There are maybe performance reasons why Swift’s choice is better. But really, it was forced by other factors. In Java, everything is either a primitive type, or a reference. With such a limited set of types it’s reasonable to give everything a default value – either zero, empty, or null. But Swift isn’t so simple. It doesn’t even really have “primitive” types – even Int is a struct. And while it has references, they aren’t always nullable. So everything having a default isn’t really an option. So it follows that in Swift you can’t have an Array where you just declare it to be a given size then plunge in getting and setting elements at arbitrary indices. I mean, you could write an array that worked like that, but then you’d have to track internally when values for given index had been set or not. So instead, to make an array have n elements, you have to put n in. You can do that easily with Array(count: n, repeatedValue: ??? ), but for our purposes, what would you put as the value? Element is completely generic, you don’t know anything about it, so there’s no reasonable default. One solution is to use an array of Optional. That way, you can set them all to nil. Probably this would be one of those rare legit uses of an implicitly-unwrapped optional – where you can prove that at the time you use the optional that it wil never be nil, so there’s no harm unwrapping it implicitly. In fact, you’d like it to assert if you ever unwrapped a nil, as this would mean there was something horribly wrong with your logic. This now works, and is pretty much like the Java version. But implicitly-unwrapped optionals are a bit unpleasant, and anyone unhappy about the merge sort’s linear space requirements might blanche at the extra bits they take up. And the rest isn’t very Swift-y. Those for loops and ++ are not long for this world, and it’ll bit a bit painful to translate this into a fully generic function. Flip it around and have the merge logic copy into the aux array, then copy back into self, using append, removing the need to size it up at the beginning. OK, now to make it generic. A lot of that rework from before will make this easier. I admit, I haven’t quite got my head around whether this is an OK thing to do or not. For almost every reasonable circumstance, this will be a no-op, since Distance will be an Int. If for some reason you were using a class that used a smaller Distance, it will upconvert it. There’s a slim chance that Distance could be bigger than an Int – say if you’re on 32-bit platform but using a collection that used an explicit 64-bit index? Or maybe some giant virtual collection that used a BigInt? But for now I shall ignore these possibilities with reckless abandon. The trick is, knowing which ones are indices, and which ones are distances (by which indices will be advanced). lo is an Index – that’s what we pass in to merge as lo. The calculated mid and hi are indices too. When you see 0 as an index, that really means startIndex so we can substitute that. The only other tricky part is N. With zero-based integer indices, N could mean two things: the length of the collection, or the end of the collection (i.e. startIndex.advancedBy(N)). Here, in this inner loop, it means the latter. So N-sz means “back from the end by sz“. Similarly min(lo+sz*2, N) means “add sz*2 to lo, or endIndex if that goes past the end”. So you could write min(lo+sz*2, N). But there’s already a function for “go this far, but not past this point”. advancedBy is overloaded with a version that takes a limit: argument. So instead, you can write this as lo.advancedBy(sz*2,limit: endIndex)). This is arguably more correct as well, since it could be an error to add a distance to an index to take it past the end of the collection (like with String indices). Again, if you’re doing this in Xcode, the compiler will help you along (for example, it will complain if you’re trying to take the minimum of an index and a distance, since you can’t do that, which is a hint you need an index instead of a distance). One final gotcha. After you make all these changes and you’re sure everything is correct, the stride still won’t compile. We need one more constraint on the protocol: Index.Distance == Index.Stride. Yes, this should always be the case (that’s the whole point of making random-access indices strideable – so you can stride by Distance), but you still need to make it explicit. I’d suggest you try it out on a mutable random-access collection that doesn’t have integer indices. Except, uh, there aren’t any. There are random-access collections without integer indices – reverse collections for example. Or (with a bit of extension-bullying) String.UTF16View. But unfortunately these aren’t mutable! So perhaps I’ve just totally wasted your time. But it was fun, right? OK so there’s also a much more important benefit to this – it no longer relies on the index starting from zero. Yes, we could have done this for CollectionType where Index: IntegerType, but that would probably have been harder, since the compiler would not have helped as much when we made invalid assumptions. The 0 instead of startIndex might be easy to catch, but assumptions about when N means endIndx vs when N means self.count are much tricker.